As matter “cooks” to 4 trillion degrees Celsius—250,000 times hotter than the center of the sun—protons and neutrons melt into a liquid plasma of quarks and gluons. This liquid may have been present at the start of the universe for a few microseconds. See how Dr. Justin Frantz Catches a Glimpse of a New State of Matter. 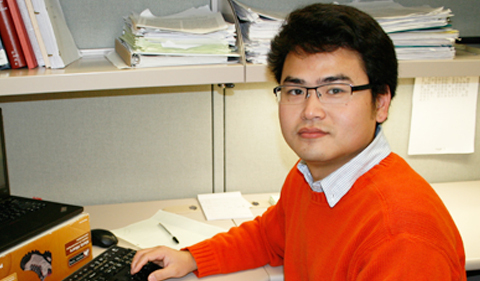 And read more about his team’s research in the following Perspectives article. For people who study such tiny objects as protons, neutrons, quarks, and gluons, particle physicists do things big. They belong to teams of collaborators that comprise hundreds; they work in laboratories that extend for miles; and they generate thousands of terabytes of data. Yet these grand behaviors are not acts of bravado; rather, they are performed out of necessity. Frantz’s experiments are designed to unravel the mysteries of the strong force, one of the four fundamental interactions in nature. 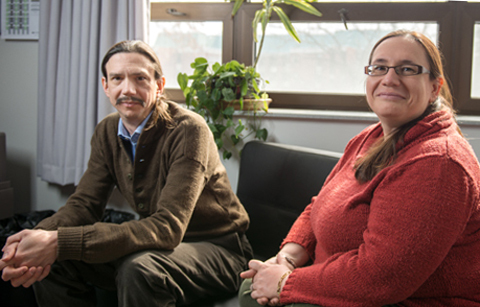 Two other Ohio University physicists—Associate Professor Dr. Julie Roche and Assistant Research Professor Dr. Paul King—are examining another of the fundamental interactions: the weak interaction. They also rely on big instruments, big data sets, and big collaborations to answer questions. It turns out you can learn a lot by smashing particles together. 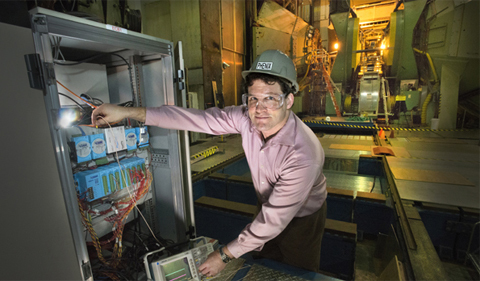 Frantz and his team of about 500 scientists are using the technique to study the strong force, which holds together all the protons and neutrons of the universe. To investigate this force, the scientists use a facility called RHIC, a more than two-mile-long relativistic heavy ion collider located at Brookhaven National Laboratory in New York. The goal is to break up the ions’ protons and neutrons into their component quarks and gluons. The result is a substance, called the quark-gluon plasma, which Frantz says may exist outside the laboratory at the center of neutron stars and likely was present for a few microseconds just after the Big Bang explosion. “We’re interested in understanding more about the quark-gluon plasma not only as a way of gaining a better understanding of the strong nuclear force and of what happened in the evolution of our universe, but also because it may even help us improve our basic understanding of quantum mechanics,” he says. 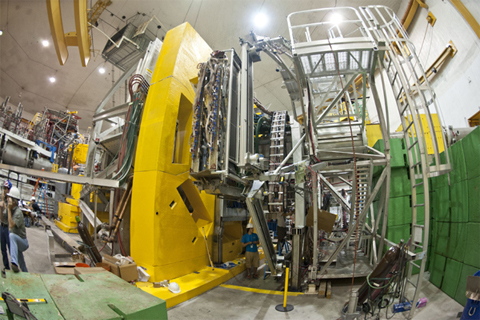 To conduct their experiments, the team uses the PHENIX detector at RHIC to “look” inside the quark-gluon plasma in much the same way that X-rays “look” inside the human body. “When we first set out to study the quark-gluon plasma, we expected it to behave like a gas; however, we were surprised to find that it behaves more like a liquid,” Frantz says. Much of Frantz’s contribution to the effort is in the form of computer programming. Julie Roche and Paul King also deal with vast quantities of data—roughly 120 terabytes in their latest experiment, called the “Q-weak experiment.” Along with a team of about 100 other scientists, Roche and King set out to measure the weak charge of the proton, something that no other physicist had done before. The weak force acts on subatomic particles. It plays a key role in the nuclear reaction processes that take place in stars and is behind much of the natural radiation present in the universe, according to the U.S. Department of Energy’s Jefferson Lab. Although the Standard Model of physics predicts the weak charge of the proton, actually measuring it experimentally has been very difficult—until now. That’s because scientists needed advances in technology and incredibly sensitive equipment to be able to detect the tiny variation in the electron scattering rate that would produce the measurement. Over the course of 10 years, the researchers constructed a special detector at the Jefferson Lab in Virginia. The Ohio University team contributed to the project by designing and installing the data acquisition system and the analysis software. During the two years of data collection, they provided 24-hour on-call support. In the experiment, scientists directed a beam of electrons into a container of liquid hydrogen, rapidly changing the direction of the electrons’ spin back and forth. The weak charge could be measured based on its unique interaction with the electrons. So far, the researchers have analyzed four percent of the data they generated. “Our results agree with the Standard Model prediction, which is not a surprise at this level of precision,” Roche says. However, once they have the full results, which will be much more precise, the team could see the effects of exotic physics not yet included in the Standard Model of physics, Roche says. The research could complement high-energy searches for new physics discoveries at the Large Hadron Collider in Geneva, Switzerland. Roche believes the full data set will take her team a few years to analyze. In the meantime, she is already planning her next experiment to measure the weak charge of the electron. Although she is eagerly awaiting the results of these experiments, she says she enjoys the process of working with her collaborators. Frantz, too, values the time he spends with his fellow scientists. Although his team of about 500 individuals is divided into smaller working groups to perform different tasks (an elaborate management structure exists to run the collaboration), the larger group does meet regularly, and Frantz has become well acquainted with each and every one of his colleagues. And that, he adds, is the kind of large-scale teamwork that gets the enormous job of understanding nature’s most fundamental interactions done. This story appeared in the Spring/Summer 2014 issue of Ohio University’s Perspectives magazine, which covers research, scholarship and creative activity.